Mosaic tiles have been a classic in interior designs for many years and whilst their popularity fluctuates, right now it is the next trendy home decor. Their versatility and range of designs have proven time and time again just how good mosaics can look at home without breaking the bank. Mosaic tiles are a common go-to for creating a beautiful kitchen splashback, that not only looks good but also protects your kitchen from damage. A mosaic design doesn’t have to be expensive or really bold; you always have the option to go for something simpler that will blend in with your busy kitchen. Mosaic tiles give you the perfect opportunity to create a stylish covering that will last many years and is easy to clean and maintain. A kitchen is also a place where expression can be difficult, after all, there’s only so many colours a pan can be bought in, so a mosaic splashback can give personality to a room that mostly cannot be decorated to our individual tastes. It sounds odd to have mosaic tiles in the living room, doesn’t it? In fact, mosaics can be the answer to all your design issues. Say you have a fireplace in your living room and there’s nothing to go on the wall above it. Sure, a framed picture might look good, but they’re difficult to clean and don’t really last long before the frame breaks or someone nudges it off the nail. The answer is, a centre mosaic piece. Mosaic tiles come in a wide range of materials such as glass or resin and all sorts of luxurious colours, patterns and textures so there’s something out there for everyone. Mosaic tiles are usually associated with bathrooms and kitchens, however it’s definitely a good idea not to overlook them when revamping your living room. Speaking of bathrooms, mosaic tiles in a bathroom are a classic that all homes can benefit from. They’re extremely resistant to heat and condensation meaning you can relax and enjoy your shower without having to worry about leaks and cracks down your shower cabin. Whether you’re going more for a dark, luxury hotel look or a white, spacious and bright chic ‘city apartment’ look, mosaic tiles are what brings the entire bathroom together. With such a range in our stock too, there is definitely a design out there that will match your bathtub and even your towels and soap dispensers. Bold colours have recently become very fashionable in home design, so perhaps try a dark mosaic design with hints of bright pink, orange and red. Or maybe bright blue, purple and green. Who said bathrooms can’t look cool! Mosaic tiles will definitely help you create the perfect space to relax in after an exhausting day. There is nothing nice than spending the warm summer evenings in a beautiful blooming garden, or cold winter evening watching the stars with some hot chocolate and few blankets. Whatever you may prefer, we can all agree that a beautifully designed garden is what pulls an entire house together and can definitely make a good impression on the guests. Mosaic tiles have been used as garden decor for many years all over Europe and America and the silent trend is slowly reaching Britain as we see more and more people opting for a funky, fresh, colourful design made up of mosaic tiles in their gardens. For example, it could be a great way to pave your path to your flowerbeds or even be the main design as you step out into the garden to introduce it. If your garden is quite small, to create the illusion of more space, why not go for bright colours such as white and different shades of blue or purple. Mosaic tiles will also be easy to clean any dirt or mud off them, just spray them with water and add a little soap and mop it up! Staying outside, have you ever thought of mosaic tiles on concrete fencing or even your gate? Doubt it, which makes sense as they’re not very popular in that way. Yet they are the perfect alternative to make the entrance to your home grander as they’re affordable and resistant to all weather types. If you have a large concrete fence surrounding your front garden, it can make your property look a little dull, even if the inside is bright and stylish. Investing in some mosaic tiles can lift the spirits of the front of your home and dress up your fence or gate without having to completely repaint it or install a new one. Speak to Unique Tiles to find out how we could do this for you. 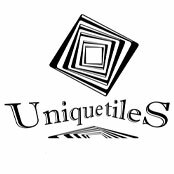 Unique Tiles offer a large range of custom made mosaic tiles to choose from, enough to decorate each room in your house differently! Now, by far this is our favourite use of mosaic tiles. Untraditional, quirky and original; using mosaic tiles as a way to decorate the very front wall of your house is a bold statement of originality in itself. Whilst red brick is a classic for British homes that looks classy, it can definitely do with a touch up that not only shows our personalities but can also withstand the test of time and last for years. Mosaics are great for this and they let you have the option to go for either a small, delicate piece or go all out with a large, eye-catching picture that will draw in the compliments from your guests. Whatever your tastes and preferences, your interior design can definitely be improved and made unique with custom mosaic tiles. They are resistant, tough and look good no matter what texture or colour you go for.